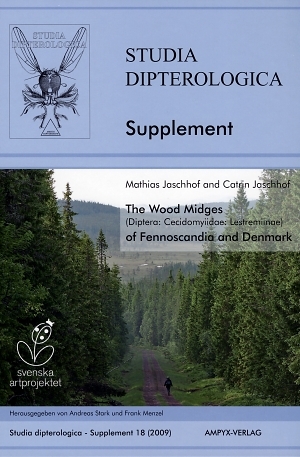 Voucher specimens in museum collections and specimens obtained in the years 2004 and 2005 attest the occurrence of 230 species of Lestremiinae (wood midges) in all of Fennoscandia and Denmark. Half of these species are rated as rare, a fact that suggests the recent Fennoscandian fauna might actually contain between 250 and 300 species. Twenty-six species were recorded from Denmark, 109 from Norway, 203 from Sweden, 162 from Finland, and 105 from the Republic of Karelia. These figures mainly reflect regional imbalances in faunistic survey that to date has been especially sparse in Denmark and Norway. Species-based information is presented on adult morphology (including diagnoses and keys that facilitate identification), on distribution and on phenology. The diversity of Fennoscandian Lestremiinae is also considerable at the supraspecific level. All of the 9 tribes known from the Holarctic region have representatives in Fennoscandia, as well as 28 of the 39 known genera. An illustrated key to the Holarctic tribes and genera is presented. Lestremiines have postglacially recolonized all of Fennoscandia, but the greatest species richness today is found between 59°N and 67°N. A single stand of old-growth taiga at 62°N in Russian Karelia was proven to contain 105 species of Lestremiinae. Recent distribution patterns suggest that the postglacial immigration of wood midges to Fennoscandia followed largely the eastern route via Karelia. Whether or not the Scandinavian Mountains have represented, or still represent, an effective barrier for lestremiine dispersal cannot yet be testified due to insufficient faunistic information from the western side of the mountain range. Besides the large number of widespread European species, the Fennoscandian wood midge fauna contains a distinct boreomontane element, while an endemic, exclusively nordic element is presumably absent. Fifty-six species, which is nearly one fourth of all the species found, are new to science. This reflects the comparatively poor state of taxonomic knowledge of the Lestremiinae in the Palaearctic region, including Europe, which is generally regarded as the best explored among all the regional faunas worldwide. The adult morphology of Lestremiinae is outlined and re-examined in the context of phylogeny and classification. The concepts of the Holarctic genera and tribes are reviewed. Evidence from adult morphology suggests the Lestremiinae are a paraphyletic assemblage. In future classifications, the name Lestremiinae should be used to denote only the present Lestremiini and the remaining tribes (Catochini, Strobliellini, Acoenoniini, Campylomyzini, Peromyiini, Pteridomyiini, Bryomyiini, Micromyini, and Aprionini) should be assigned to the subfamily Micromyinae, the concept of which was introduced by B. M. Mamaev forty years ago. The phylogenetic relationships of Cecidomyiidae are hypothesized as follows: Catotrichinae + [Lestremiinae + ((Micromyinae + (Porricondylinae + Cecidomyiinae))], with the Porricondylinae being a paraphyletic grouping that is in need of taxonomic revision. The systematic position of the Cecidomyiidae in relation to the Sciaroidea is discussed. The following new taxa, all to be attributed to the senior author, are described: Aprionus adventitius spec. nov., A. aquilonius spec. nov., A. brevitegminis spec. nov., A. fennicus spec. nov., A. foliosus spec. nov., A. gladiator spec. nov., A. heothinos spec. nov., A. hintelmannorum spec. nov., A. hybridus spec. nov., A. karsios spec. nov., A. kivachensis spec. nov., A. latitegminis spec. nov., A. oligodactylus spec. nov., A. praecipuus spec. nov., A. reduncus spec. nov., A. sievertorum spec. nov., A. stiktos spec. nov., A. taigaensis spec. nov., A. victoriae spec. nov., Campylomyza abbreviata spec. nov., C. alnea spec. nov., C. arcuata spec. nov., C. borealis spec. nov., C. cingulata spec. nov., C. falcifera spec. nov., C. hybrida spec. nov., C. inornata spec. nov., C. insolita spec. nov., C. mohrigi spec. nov., C. paenebicolor spec. nov., C. pubescens spec. nov., C. stegetfore spec. nov., Catarete minuta spec. nov., Catocha angulata spec. nov., C. incisa spec. nov., C. subalpina spec. nov., Eomastix gen. nov., Heterogenella minuta spec. nov., Monardia (Monardia) malaisei spec. nov., Monardia (Trichopteromyia) relicta spec. nov., Monardia (Xylopriona) truncata spec. nov., Neurolyga acuminata spec. nov., N. angulosa spec. nov., N. constricta spec. nov., N. interrupta spec. nov., N. lonsdalensis spec. nov., N. paludosa spec. nov., Peromyia abdita spec. nov., P. bertviklundi spec. nov., P. clancula spec. nov., P. denotata spec. nov., P. fibyensis spec. nov., P. menzeli spec. nov., P. ramosoides spec. nov., P. scirrhosa spec. nov., P. semotoides spec. nov., and P. subbicolor spec. nov.
New synonyms are proposed as follows: Acoenonia parvolobata Mamaev & Berest, 1992 syn. nov. [of Acoenonia europaea Mamaev, 1964]; Allarete distincta Mamaev, 1963 syn. nov. and Allarete turkmenica Mamaev & Zaitzev, 1998 syn. nov. [of Allarete vernalis (Felt, 1908)]; Allarete (Allaretina) kirghizica Mamaev & Zaitzev, 1998 syn. nov. [of Allarete nigra Mamaev, 1994]; Aprionus bisectus Mamaev, 1998 syn. nov. [of Aprionus spiniger (Kieffer, 1894)]; Aprionus cariflavidus Jaschhof, 1998 syn. nov. [of Aprionus bostrichus Berest, 1997]; Aprionus gracilipennis Mamaev, 2001 syn. nov. [of Aprionus lapponicus Jaschhof & Mamaev, 1997]; Aprionus internuntius Jaschhof, 2003 syn. nov. [of Aprionus stylifer Mamaev, 1998]; Aprionus paludosus Jaschhof & Mamaev, 1997 syn. nov. and Aprionus bicuspidatus Mamaev, 1998 syn. nov. [of Aprionus styloideus Mamaev & Berest, 1990]; Aprionus pullatus Mamaev, 1998 syn. nov. and Aprionus trunculus Mamaev, 1998 syn. nov. [of Aprionus miki Kieffer, 1895]; Aprionus ungulatus Jaschhof, 1997 syn. nov. and Aprionus bicruris Mamaev, 1998 syn. nov. [of Aprionus aviarius Mamaev & Berest, 1990]; Bryomyia floccosa Fedotova, 2004 syn. nov. [of Bryomyia apsectra Edwards, 1938]; Bryomyia incisa Mamaev, 1963 syn. nov., Bryomyia longipennis Mamaev, 1963 syn. nov. and Bryomyia montana Mamaev, 2001 syn. nov. [of Bryomyia gibbosa (Felt, 1907)]; Bryomyia uralensis Mamaev, 2001 syn. nov. [of Bryomyia bergrothi Kieffer, 1895]; Campylomyza subsicca Fedotova, 2004 syn. nov. [of Heterogenella linearis Yukawa, 1971]; Cordylomyia montana Mamaev, 1963 syn. nov. [of Neurolyga truncata (Felt, 1912)]; Cordylomyia obsoleta Mamaev & Rozhnova, 1982 syn. nov. and Cordylomyia terricola Mamaev & Rozhnova, 1983 syn. nov. [of Neurolyga excavata (Yukawa, 1967)]; Cordylomyia subarctica Mamaev, 1990 syn. nov. [of Neurolyga bilobata (Mamaev & Rozhnova, 1982)]; Forbesomyiini Pritchard, 1960 syn. nov. [of Catochini Edwards, 1938]; Heterogenella miscella Mamaev, 1998 syn. nov. and Heterogenella biradiata Mamaev & Berest, 2005 syn. nov. [of Heterogenella cambrica (Edwards, 1938)]; Heterogenella monteviva Mamaev & Berest, 1991 syn. nov. [of Heterogenella bigibbata Mamaev & Berest, 1991]; Heterogenella multifurcata Spungis & Jaschhof, 2000 syn. nov. [of Heterogenella finitima Mamaev, 1998]; Lestremia albipennis Waltl, 1837 syn. nov., Lestremia intercalaria Mamaev, 1998 syn. nov. and Lestremia albidipennis Gagné, 2004 syn. nov. [of Lestremia cinerea Macquart, 1826]; Monardia (Pezomyia) longicauda Mamaev, 1963 syn. nov. [of Monardia (Monardia) stirpium Kieffer, 1895]; Monardia longicornis Mamaev, 1963 syn. nov. [of Monardia (Xylopriona) atra (Meigen, 1804)]; Neurolyga punctata Fedotova, 2004 syn. nov. and Neurolyga vasilii Fedotova, 2004 syn. nov. [of Heterogenella linearis Yukawa, 1971]; Peromyia baccha Mamaev, 1998 syn. nov. [of Peromyia curta Jaschhof, 1997]; Peromyia decurvata Mamaev, 1998 syn. nov. and Peromyia miniuscula Mamaev, 1998 syn. nov. [of Peromyia concitata Mamaev & Berest, 1994]; Peromyia longicostalis Mamaev & Zaitzev, 1997 syn. nov. [of Peromyia discreta Jaschhof, 1997]; Peromyia membranacea Fedotova, 2004 syn. nov. and Peromyia squarrosa Fedotova, 2004 syn. nov. [of Peromyia truncata Yukawa, 1967]; Peromyia palposa Mamaev & Zaitzev, 1997 syn. nov. [of Peromyia borealis (Felt, 1920)]; Peromyia penisulae Mamaev, 1998 syn. nov. [of Peromyia muscorum (Kieffer, 1895)]; Peromyia sphaerica Berest, 1991 syn. nov. [of Peromyia cornuta (Edwards, 1938)]; Peromyia subanatina Mamaev & Zaitzev, 1997 syn. nov. [of Peromyia anatina Mamaev & Berest, 1990]; Peromyia trifurcata Mamaev, 1998 syn. nov. [of Peromyia caricis (Kieffer, 1901)]; Peromyia viklundi Jaschhof, 1997 syn. nov. and Peromyia bipuncta Jaschhof, 2001 syn. nov. [of Peromyia scutellata Mamaev, 1990]; Polyardis anomala Mamaev, 1993 syn. nov. [of Polyardis adela Pritchard, 1947]; Polyardis brevis Mamaev, 1993 syn. nov. [of Polyardis silvalis (Rondani, 1840)]; Polyardis delicata Mamaev, 1993 syn. nov. [of Polyardis adela Pritchard, 1947]; Polyardis detriticola Mamaev, 1993 syn. nov. [of Polyardis silvalis (Rondani, 1840)]; Polyardis explicata Mamaev, 1993 syn. nov. [of Polyardis adela Pritchard, 1947]; Polyardis fallax Mamaev, 1993 syn. nov. and Polyardis glabra Mamaev, 1993 syn. nov. [of Polyardis silvalis (Rondani, 1840)]; Polyardis pontignanorum Mamaev & Zaitzev, 1998 syn. nov. [of Polyardis adela Pritchard, 1947]; Sidorenkomyia Fedotova, 2004 syn. nov. [of Heterogenella Mamaev, 1963]; Skuhraviana media Mamaev, 1994 syn. nov. [of Skuhraviana triangulifera Mamaev, 1963]; and Xylopriona plicans Mamaev, 1993 syn. nov. [of Monardia (Xylopriona) toxicodendri (Felt, 1907)]. The following synonymies are affirmed: Aprionus cariflavidus Jaschhof, 1998 syn. affirm. [of Aprionus bostrichus Berest, 1997]; and Cordylomyia Felt, 1911 syn. affirm. [of Neurolyga Rondani, 1840]. Bryomyia apsectra Edwards, 1938 spec. rev. is revived from the synonymy with Bryomyia producta (Felt, 1908). The following are new combinations: Allarete bhokarensis (Deshpande, Shaikh & Sharma, 2002) comb. nov., Allarete deepica (Deshpande, Shaikh & Sharma, 2002) comb. nov., Allarete indica (Deshpande, Shaikh & Sharma, 2002) comb. nov., and Allarete spinosa (Deshpande, Shaikh & Sharma, 2002) comb. nov. [all from Anaretella]; Aprionus plicatus (Fedotova, 2004) comb. nov. [from Campylomyza]; Eomastix incerta (Jaschhof, 2002) comb. nov. [from Gongromastix]; Heterogenella aurita (Fedotova, 2004) comb. nov. [from Sidorenkomyia]; Heterogenella puberula (Li & Bu, 2001) comb. nov. [from Bryomyia]; Heterogenella punctata (Fedotova, 2004) comb. nov. [= Heterogenella linearis (Yukawa), from Neurolyga]; Heterogenella subsicca (Fedotova, 2004) comb. nov. [= Heterogenella linearis (Yukawa), from Campylomyza]; Heterogenella vasilii (Fedotova, 2004) comb. nov. [= Heterogenella linearis (Yukawa), from Neurolyga]; and Trichopteromyia dissecta (Fedotova, 2004) comb. nov. [from Polyardis]. The genus Vasiliola Fedotova, 2004 is transferred from the Lestremiinae-Strobliellini to the Porricondylinae-Winnertziini, presumably being identical with Winnertzia Rondani, 1860. Baeonotus microps Byers, 1969 is transferred from the Lestremiinae to the Cecidomyiidae incertae sedis. Das Auftreten von 230 Arten der Lestremiinae (Holzmücken) ist in Fennoskandien und Dänemark durch Museumsexemplare und Materialaufsammlungen der Autoren aus den Jahren 2004 und 2005 belegt. Die Hälfte davon fällt in die Kategorie der seltenen Arten, weshalb davon auszugehen ist, dass die fennoskandische Fauna tatsächlich zwischen 250 und 300 Holzmücken-Arten umfasst. In Dänemark sind nunmehr 26 Arten nachgewiesen, in Norwegen 109, in Schweden 203, in Finnland 162 und in der Republik Karelien 105. Diese Zahlen widerspiegeln in erster Linie die bestehenden regionalen Ungleichgewichte in der faunistischen Durchforschung, wobei die größten Defizite für die dänische und norwegische Fauna zu konstatieren sind. Die nachgewiesenen Arten werden hinsichtlich ihrer Imaginalmorphologie (einschließlich Artdiagnosen und Bestimmungsschlüssel), Verbreitung und Phänologie dargestellt. Die beachtliche Diversität fennoskandischer Lestremiinae wird auch oberhalb des Artniveaus deutlich. Alle 9 aus der Holarktis bekannten Tribus sind in Fennoskandien vertreten, genauso wie 28 der 39 holarktischen Gattungen. Ein illustrierter Bestimmungsschlüssel erlaubt die Erkennung aller in der Holarktis auftretenden Tribus und Gattungen. Lestremiinen haben in postglazialer Zeit das gesamte Fennoskandien wiederbesiedelt, wobei der größte Artenreichtum heute zwischen 59°N und 67°N angetroffen wird. In einem einzigen borealen Altholz-Bestand auf 62°N in Russisch-Karelien wurden 105 Lestremiinen-Arten nachgewiesen. Die heutigen Verbreitungsmuster der Arten legen nahe, dass Holzmücken auf ihrer nacheiszeitlichen Einwanderung nach Fennoskandien mehrheitlich der östlichen, durch Karelien führenden Route folgten. Ob das Skandinavische Gebirge ein effektives Ausbreitungshindernis für Holzmücken dargestellt hat bzw. weiterhin darstellt, ist auf der Grundlage der verfügbaren Daten – die westlich der Bergkette besonders spärlich sind – nicht zu beurteilen. Neben vielen in Europa weit verbreiteten Arten weist die fennoskandische Holzmücken-Fauna ein ausgeprägtes boreomontanes Element auf. Ein endemisches, auf den Norden beschränktes Element ist nicht sicher zu erkennen. 56 Arten, also nahezu ein Viertel der Gesamtartenzahl, ist neu für die Wissenschaft ein deutlicher Hinweis auf den vergleichsweise dürftigen Stand unserer Kenntnis paläarktischer und europäischer Lestremiinae, einer Fauna, die im allgemeinen als die taxonomisch am besten erforschte Regionalfauna überhaupt gilt. Die Imaginalmorphologie der Lestremiinae wird beschrieben und unter phylogenetischen und klassifikatorischen Gesichtspunkten neubewertet. Die Konzepte der holarktischen Gattungen und Tribus werden kritisch geprüft. Imaginalmorphologische Befunde sprechen für den paraphyletischen Charakter der Lestremiinae. In zukünftigen Klassifikationen sollte der Name Lestremiinae auf die jetzigen Lestremiini beschränkt werden. Die verbleibenden Tribus (Catochini, Strobliellini, Acoenoniini, Campylomyzini, Peromyiini, Pteridomyiini, Bryomyiini, Micromyini und Aprionini) sollten der Unterfamilie Micromyinae zugeordnet werden, deren Konzept erstmals vor 40 Jahren von B. M. Mamaev vorgeschlagen wurde. Die phylogenetische Verwandtschaftshypothese innerhalb der Cecidomyiidae stellt sich folgendermaßen dar: Catotrichinae + [Lestremiinae + ((Micromyinae + (Porricondylinae + Cecidomyiinae))], wobei die Porricondylinae paraphyletisch sind und einer umfassenden taxonomischen Revision bedürfen. Die systematische Stellung der Cecidomyiidae zu den Sciaroidea wird diskutiert. Zu den Neukombinationen, Namensrestitutionen, aufgedeckten oder bestätigten Synonymen und den neu eingeführten Taxa, die unter der Autorschaft des Erstautors beschrieben werden, informieren Sie sich bitte in der englischen Fassung (Abstract).